Having plants in your office or home is thought to bring a calming effect to the working environment. Of course, the only thing about plant is that they aren't exactly great company, just nice to look at. Plus, it's pretty easy to forget to water them, and they have no way of telling you they are literally dying of thirst. Until now. At team of researchers at Keio University figured out a way of helping plants express emotions and communicate with people through different movements--in quite a straightforward way. The shrub is placed in a special plant pot, containing cords and motors. The cords are hooked up to different parts of the plant, and the motors will pull on the cords, causing the plant to jerk to life. The movements are timed with two sensors attached to the plants, a microphone, and a motion sensor. The plant will then react to the movements and sounds around it. The researchers currently have a number of emotions the plant can convey, such as anger or happiness from being stroked. The plants in the image and video below have been rigged up to the motor system for around a year now, and have yet to wilt from the stress of being pulled around. 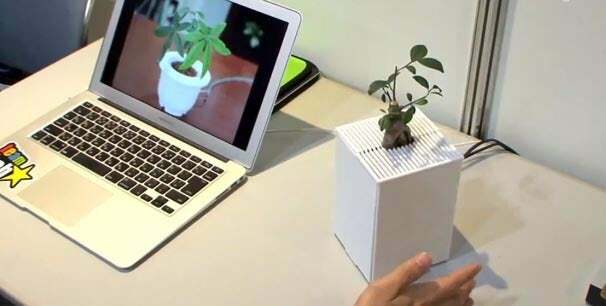 The team hope that the project will encourage people to communicate with plants in their daily rountine, plus the researchers want to make bigger versions of the system for different types of plant.